The prompt for day twenty-three is to write a historic poem. I personalized my poem because I'm feeling a little blue tonight. to lead her to the other side. wasn’t strange at all to her. 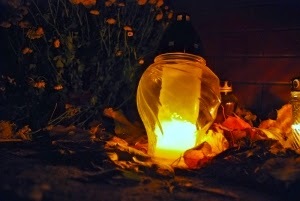 with a mausoleum of light-bulbs she planted to lead her to the other side" -- unforgettable image! And, the attached photo brings tears to my eyes. Just beautiful! Thank you, Nurit! I'm glad to hear you felt a connection. Wow, this is quietly majestic. Well done.